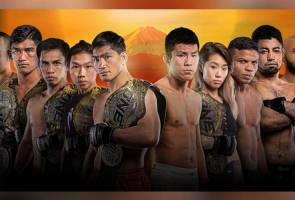 KUALA LUMPUR: ONE Championship will finally make its long-awaited debut in Japan with an action-packed event this coming Sunday, 31 March. The organization’s upcoming spectacle, ONE: A NEW ERA, will feature many of the world’s best martial arts stars, and some huge names will make their promotional debut at the Ryogoku Kokugikan in Tokyo. The 15-bout card will entertain the masses from start to finish. Here are four reasons why Malaysians cannot miss ONE: A NEW ERA. Four months after introducing himself to his nation with an electrifying knockout in his hometown of Kuala Lumpur, Mohammed 'Jordan Boy' Mahmoud will put his skills to the test once again — this time, he meets two-time Muay Thai World Champion Panicos Yusuf. The 22-year-old will face the Cypriot in a ONE Super Series Muay Thai bantamweight contest, and he promises to add another knockout to his impressive tally of highlight-reel finishes. Mohammed is determined and confident, and he has urged all Malaysians to show him support as he represents them in Tokyo. Two of the most beloved names from the kickboxing and Muay Thai worlds will battle it out for the second time. Exactly 11 years following their first incredible battle, Dutch legend Andy 'Souwer Power' Souwer and Thai icon 'The Hero' Yodsanklai IWE Fairtex will face-off in a highly-anticipated ONE Super Series kickboxing clash. There are no bigger names in the sport than these two warriors, and the Japanese faithful are promised to get a masterful display of striking. Demetrious 'Mighty Mouse' Johnson and Eddie 'The Underground King' Alvarez will finally make their long-awaited ONE debut at this showcase. Johnson, a 12-time Flyweight World Champion, goes up against Yuya Wakamatsu in a ONE Flyweight World Grand Prix quarter-final bout. Meanwhile, Alvarez, a four-time Lightweight World Champion, collides with fellow knockout artist Timofey Nastyukhin in the last ONE Lightweight World Grand Prix quarter-final match. Fans have been waiting to see these two North American legends compete ever since they joined The Home Of Martial Arts in October, and now, the wait is nearly over. For the first time, the world’s largest martial arts organization will feature a record-setting four World Title bouts on a single card. In the main event, Japanese martial arts icon Shinya 'Tobikan Judan' Aoki will try to regain the ONE Lightweight World Title from the division’s reigning king, Eduard 'Landslide' Folayang. Also, two-division ONE World Champion Aung La 'The Burmese Python' N Sang defends the middleweight belt against Ken Hasegawa, and 'Unstoppable' Angela Lee challenges ONE Women’s Strawweight World Champion 'The Panda' Xiong Jing Nan for her crown. Last, but not least, ONE Bantamweight World Champion Kevin 'The Silencer' Belingon battles longtime rival Bibiano 'The Flash' Fernandes for the third time. The winner of this rubber match will leave the Ryogoku Kokugikan with the division’s World Title.